The newly released eLearning Market Trends and Forecast 2017-2021 report by Docebo, a leading LMS, addresses the emerging technology, new learning trends and evolving business needs that will shape the eLearning industry for the next five years. 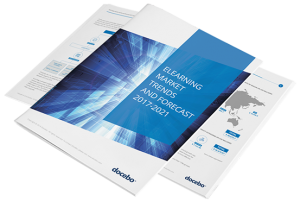 The eLearning market is predicted to experience significant global growth over the next five years, largely driven by advances in technology, evolving business needs and a number of emerging Learning & Development trends, according to Docebo’s newly released research report: eLearning Market Trends and Forecast 2017-2021. “This report pulls together metrics and insights from a wide variety of sources, including leading analyst voices in the industry,” says Kristy Sadler, Chief Marketing Officer at Docebo, a top learning management system provider. Among the most valuable insights are projected revenue numbers for the eLearning industry, the top learning technology priorities, L&D budget allocation information, and anticipated industry drivers and growth analyzed by geographic region. The report is designed to be a resource for learning and development professionals to contextualize their chosen approaches within the larger global landscape of eLearning. Sizing up the global eLearning market, from budget allocations to growth drivers. Continuing trends in eLearning, including social and mobile learning, microlearning and corporate MOOCs. Assessing disruptive technologies such as gamification and the rise of wearables. The amalgamation of this research enables readers to make informed decisions about their own learning strategies and programs, thus increasing successful training outcomes and improved business performance. Download the eLearning Market Trends and Forecast 2017-2021 report to begin taking advantage of these insights. A complete overview of both the current state and the future of the eLearning marketplace.